Hand in hand with the future! Our company management focus is: quality, clients, and reputation. We accomplish and maintain that focus from our facilities in China. At our 38,000 square meter factory equipped with advanced technology, nearly 600 workers and over 100 well-known experts produce more than 500,000 of the highest quality tires per year. Heavy-duty truck, light-duty truck, and agricultural tires are among the different types of quality products produced under the Longlin and Longda trademarks ... brands that include 4 quality tire series built to over 40 specifications. Our tire products meet the most stringent international quality standards and are, among others, certified by the United States of America's Department of Transportation (DOT). Our plant is also ISO9001 and ISO9002 Certified. 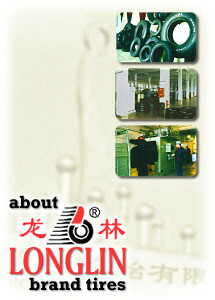 21st Century Tires has established special distribution agreements in key markets around the globe and looks forward to fulfilling your needs as the supplier for Longlin and Longda brand tires.